As the season heats up and summer approaches, store employees at Wegmans Food Markets have all been learning from Wegmans chefs on how to get amazing flavors from veggies on the grill. They can’t wait to talk with customers about these ‘best practices’ at the Grilling Harvest Event, held at all Wegmans stores (with the exception of the newest location in King of Prussia). Friday, June 8th 4 p.m. – 8 p.m.
Saturday, June 9th 11 a.m. – 5 p.m.
Sunday, June 10th 11 a.m. – 5 p.m.
It’ll be like a party wrapped up in a shopping trip! As customers arrive, they’ll see a big display of vegetables ideal for grilling including peppers, onions, eggplant, and portobella mushrooms. Balloons, activity sheets for kids and friendly employees wearing badges that say “My Favorite Veggie Is . . .” make the day more fun. Spicy Grilled Baby Peppers in the produce department. 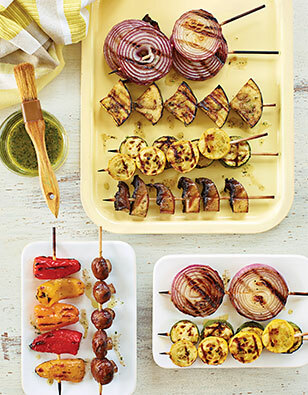 (Veggie Kabobs for easy grilling will also be for sale at select stores). Later in the season, Wegmans stores will celebrate vegetables picked at the peak of perfection with two other upcoming events: the Corn Harvest July 20th-22nd and the Tomato Harvest August 10th-12th. « AML Trunk Show: Christine Shirley Shines at White Dog Wayne!